Green tea and mooncake? Yes please! 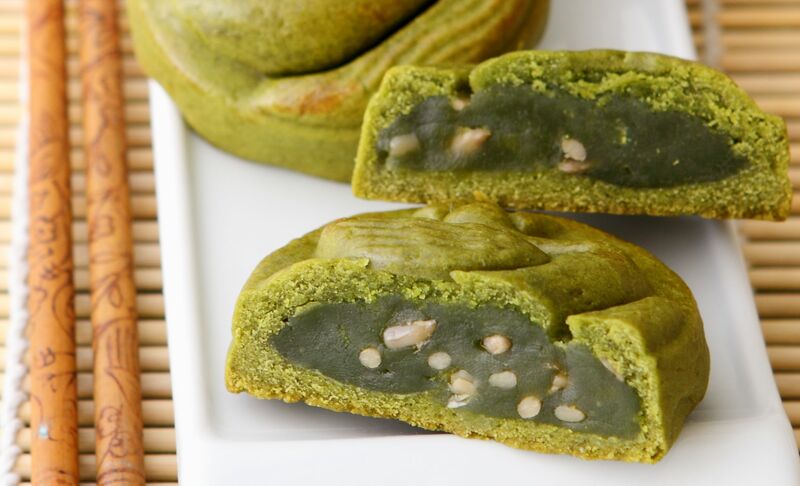 Pop a few of these green tea mooncake biscuits on a plate for tea and you’re good to go. In a bowl, combine golden syrup, oil and lye water. Cover with cling film and rest for 1 hour. Add in the green tea paste, stir to mix. Sift flour and green tea powder over and mix into a dough. Cover with cling film and rest for 1 hour. Divide into 45g portions. Combine all ingredients and divide into 35g portions. Press each dough ball into a circle. Place the filling in the centre and wrap dough around it. Press into a mould and unmould onto a greased baking tray. Pre-heat oven at 170ºC. Bake for 10 minutes. Remove from oven, brush with egg wash and bake for a further 8 to 10 minutes. Allow to cool before storing.